Mesotherapy is a non surgical treatment that involves a series of micro injections of active ingredients directly into layers of the skin. These are often ingredients naturally found in the skin such as hyaluronic acid, vitamins A, B, C, E, K, minerals, coenzymes and amino acids. .
Facial mesotherapy combats sagging and ageing of the skin, improves appearance of wrinkles and gives luminosity to the face. It does this by stimulating the skin tissue, firming and toning the skin. It restructures mature skin, repairs post traumatic skin imperfections and increases the elasticity and hydration of the skin. 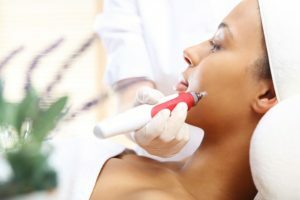 Facial mesotherapy is a great option for women and men of all ages looking to restore the health and look of their face and neck.